Welcome to our two-part series comparing the advantages of the well-designed Honeywell Wi-Fi (RTH9580WF) thermostat over the very popular Nest Learning Thermostat. These two competitors are leading the race for control over your home’s furnace, and the one that’s right for you comes down to your personal preferences. 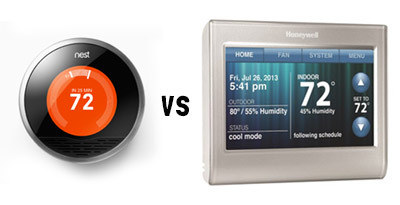 Nest Learning Thermostat vs. Honeywell Wi-Fi Smart Thermostat. Both thermostats are similarly priced ($200-$250 depending on rebates and where you shop) and offer remote access via web and mobile apps, but the Honeywell Wi-Fi model has some distinct advantages over the Nest. The Nest prides itself on its minimalist design, but that design approach comes at the cost of on-unit features. You’ll need to use the web or mobile app to fine-tune your Nest settings. The Honeywell Wi-Fi, however, lets you do almost everything on the unit itself (in addition to via the web app and the mobile apps). For a full list of everything you can do on the Honeywell’s wall unit, click here. Tighter temperature control. The Honeywell RTH9580WF wins at temperature control, keeping your home’s climate within +/- 1 degree of your desired temperature. By contrast, the Nest allows for swings of up to 3 degrees over or under your desired temperature. This means that if you set your Nest to 67 °F (19 °C), your home’s temperature may drop as low as 64 °F (17.7 °C) before the heat kicks back on. Tighter control in general. 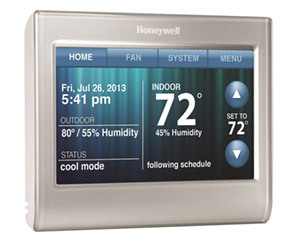 The Honeywell Wi-Fi isn’t a “learning” thermostat – you still have to give it a schedule to follow. But with this extra step comes a greater degree of control over what the thermostat is doing. Some users complain that an out-of-the-way Nest doesn’t detect people moving about the house and assumes they’re away, dropping the temperature inappropriately. E-mail alerts. You can set up the Honeywell to push an emailed alert (from the Honeywell server) if your thermostat loses connection (suggesting a power outage) or if your home’s temperature exceeds or falls below your pre-defined limits. This is a handy way of keeping an eye on your home when you’re not there. The Nest offers no emailed alerts at all. Continuous display of temperature and status. Glance at the Honeywell’s display to check its status. The Nest won’t wake up until you stand nearby and wave at it. Another nifty Honeywell feature: customizing the display’s color palette. One-button “Hold”. Honeywell has a simple press-to-hold temperature button, while the Nest lacks this common thermostat feature. Set vacation length. Honeywell lets you input how many days you’ll be away. More than 2 locations on a single account. The Honeywell Wi-Fi thermostat lets you add more than 2 locations to a single account – handy if you’re monitoring a few office buildings, a vacation home, and/or rental properties. Nest limits you to two locations per account. Users with lots of thermostats/homes to manage are disappointed by this limitation. Honeywell works for many users who had trouble with the Nest. Many of Honeywell’s positive Amazon reviews are from consumers who first tried a Nest but couldn’t get it to stay connected or function properly. The Nest claims to work in absence of a “C” wire, drawing power through the heat wire instead. Many of Nest’s negative Amazon reviews are from users and installers who struggled to get the Nest to work with their HVAC system and wiring configuration. Price advantage. Many online retailers, including Amazon.com, offer the Honeywell Wi-Fi Smart Thermostat RTH9580WF for $25-50 less than the Nest. REVIEW: Read our full Honeywell Wi-Fi (RTH95890WF) review. Is the Honeywell Wi-Fi right for you? If you favor tighter control over the temperature, emailed alerts, and controls on the wall unit itself, choose the Honeywell. 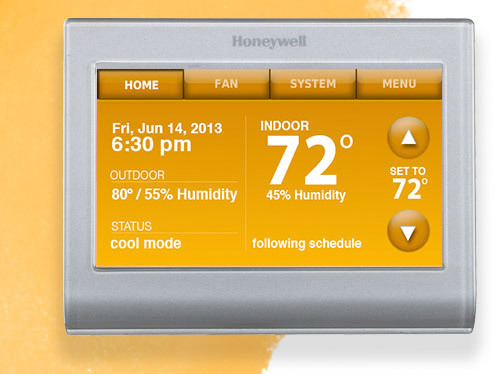 The Honeywell is also favored by homeowners who had difficulty installing a Nest. The only real drawback of the Honeywell is the lack of monthly usage reports. Still not sure? Read about the Nest’s advantages over the Honeywell Wi-Fi thermostat here! Reviews and opinions from real folks comparing the Nest and the Honeywell 9580. Why not test the top-of he-like Honeywell, the Prestige 2.0 IAQ. 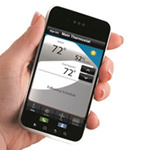 While it looks like the Wi-Fi, it has several features found on no other residential thermostat. One mind-blower is “Delta T Diagnostics”, a feature that monitors overall system performance and sends an alert if operating efficiency drops. A freon leak, a squirrel chewing a hole in a duct, a dirty filter or coil, are examples of issues that might trigger a DTD alert. It can monitor for A-coil freeze ups, take action to thaw the coil, and notify you it happened. would the RTH9580WF be capable of a different setting every third wednesday either in home or business mode?